As the leaves continue to fall and turn our lawns into colorful mosaics of bright reds, yellows and oranges, many of us will use our time and/or money to rid our lawns of them. Actually, keeping our leaves nearby is a simpler, more environmentally friendly solution, as leaves contain nutrients that are good for the soil. Shred your leaves with a lawn mower and leave them on your lawn. It's faster and easier than raking or leaf blowing and adds nutrients to the soil. Shredded leaves can be used as a mulch to help prevent weeds and keep moisture in the soil. In addition, the leaves will slowly release nutrients into the soil. Place leaves around and on top of your compost bin. This will insulate your bin and allow the material to continue to breakdown. In the spring you will have fresh compost without waiting for your pile to thaw out. Leaves are a great source of browns, materials rich in carbon, that are needed to balance greens in your compost pile like food scraps and grass clippings. Compost can be used as a mulch or mixed into the garden soil. One of the biggest challenges to composting food scraps at home is the release of water into your compost bin as the food breaks down. One of the best ways to fix this is to add leaves every time you add food scraps. Collect and store leaves in the fall, then use them throughout the rest of the year. Compost provides nutrients, improves soils structure, absorbs and holds in moisture, and adds beneficial microorganisms. 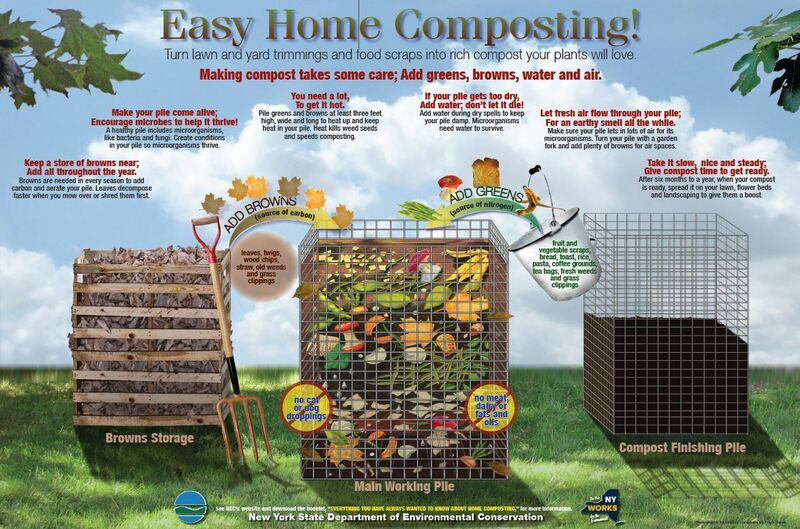 Check out our Easy Home Composting Poster.